Rebecca J. Carlson: Happy New Year! 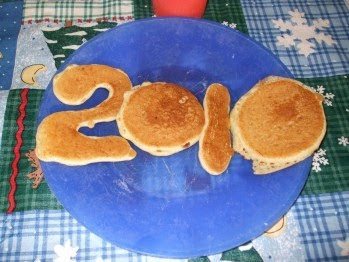 My husband, the pancake artist, created these for the first breakfast of 2010. 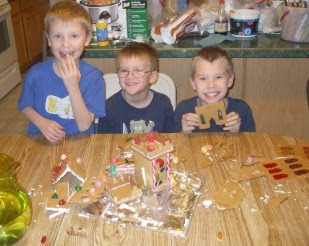 On New Year's Eve, my children always enjoy demolishing and eating the gingerbread house. Here's all that was left of the Gummi Bear Castle. what a fun way to start your new year! may 2010 bring many wonderful blessings your way! Actually, this will be the last year we eat the 6-week old gingerbread house on New Year's Eve. We all had a touch of food poisoning the next morning. argh - not fun! that seems very strange, though... never yet heard of getting food poisoning from a gingerbread house! thought they were meant to be eaten after sitting on display. I do see a suggestion on line to cover them at night to keep dust, moisture & bugs away, but no other indication of possible problems. It may have been something else we ate, but I suspect the gingerbread. Too bad, really. It was very tasty. Haha I love the pancakes! We still haven't eaten our gingerbread house--we probably ought to do it soon, before it gets too stale. Ours isn't quite 6 weeks old; the kids decorated it *after* Christmas.